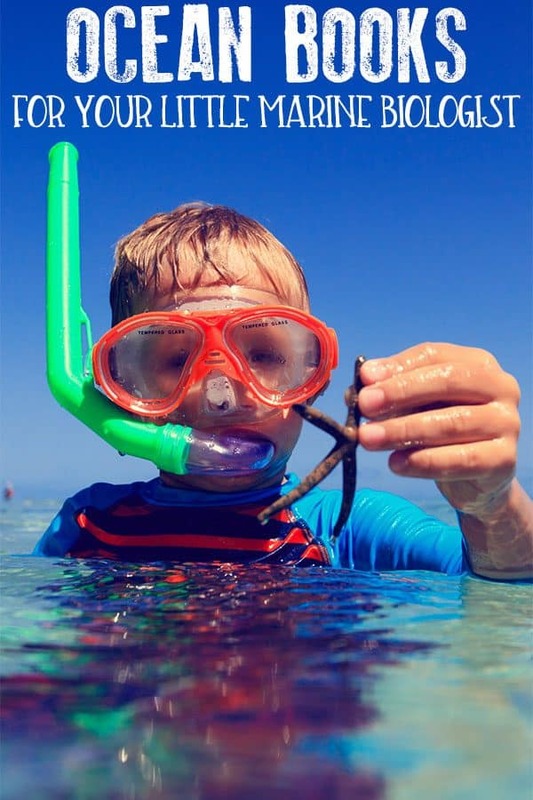 We love anything Under the Sea – reading, writing, learning, playing and creating it’s one of those themes that grips my kid’s imagination and gives them the freedom to explore even further. As a marine biologist that excites me, I love that one of my passions is something that gets kids passionate about as well, especially as the oceans are one of the last places on earth that we know very little about. As toddlers and preschoolers, it’s one of those areas that as well as plenty of crafts and activities there are plenty of books to read and authors around the world are inspired by the theme to write fiction and non-fiction. 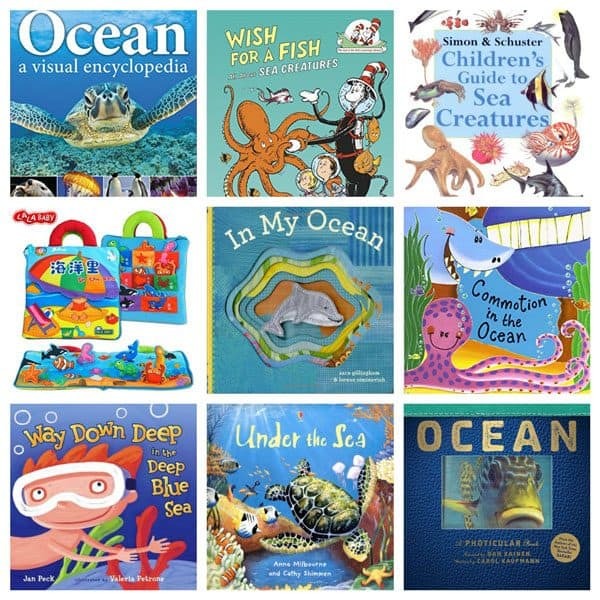 We’ve gone through our book collections and the reading records and put together our list of Favourite Ocean Books for Toddlers and Preschoolers so dig out the waterproof cases and head underwater with these under the sea stories that you and they will love. These books are linked through to Amazon.com via our affiliate links if you purchase via these links we may earn a small commission. We’re kicking off our sea animals list with an AMAZING book although aimed at older children with almost moving pictures it’s worth getting Ocean: A Photicular Book whilst with your young children you can flick through and watch the pictures and it will still be being flicked through when they are much older. I’ve said it before and I will say it again the National Geographic series of books are fantastic for kids. 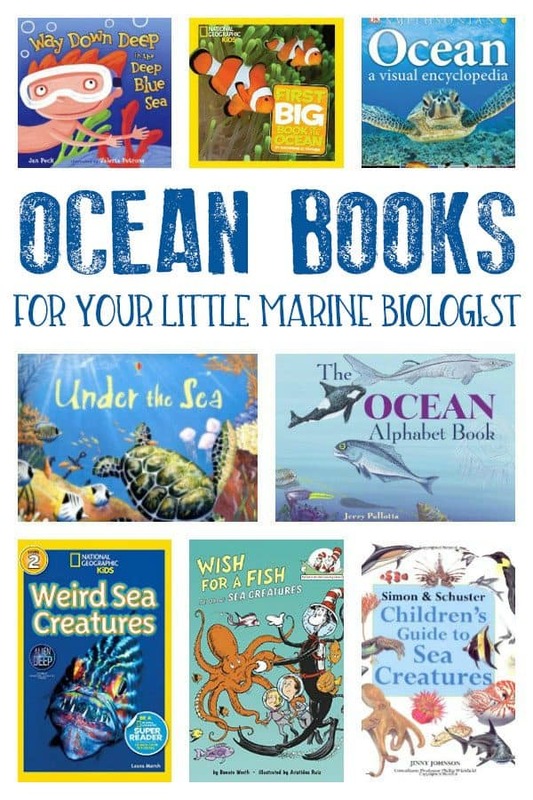 This one National Geographic Little Kids First Big Book of the Ocean is aimed perfectly at preschoolers and an ideal additional to your book basket for any ocean or under the sea themed topics. With beautiful illustrations and interesting facts Simon & Schuster Childrens Guide to Sea Creatures will be able to answer most of those questions from your inquisitive preschooler that you have no clue of the answer to. I would recommend any of this series of illustrated encyclopedias for your family bookshelves. Along with National Geographic, we also love the Eyewitness guides from DK and DK Eyewitness Books: Ocean is full of information with fantastic images and another that will last through the years so a good investment. We are very fortunate to have some signed copies of Marianne Berkes book to both of my children and although our copy of Over in the Ocean: In a Coral Reef is not signed it is still a much loved book on the shelf. I love the counting, rhymes and also language development that she focuses on connecting the mother and baby animals names correctly. Have you read any of the non-fiction books based on the style of Dr Seuss? They are great and a fun read but also full of facts and information Wish for a Fish: All About Sea Creatures Cat in the Hats Learning Library is great for learning about the ocean as you travel through the depths learning about the different eco-systems and the weird and wonderful creatures that can be found there. Do watch out for our Sea Turtle book list coming soon as they were my specialist as a marine biologist but in the mean time Sea Turtles: Amazing Pictures and Animal Facts Everyone Should Know by Ann Lawrence is a good non-fiction book for you and your child to read featuring all 7 species of turtles. Without a doubt your book shelf should contain some encyclopedia’s although the internet is great children need to learn how to use these classic books for research and for your budding marine biologist Ocean: A Visual Encyclopedia is a perfect starter to discover more about the oceans of the world and learn how to use encyclopedias as well. The Ocean Alphabet Book Jerry Pallottas Alphabet Books goes through the creatures of the ocean in alphabetical order providing a little snippet of information about each creature and an illustration. This is a great book for the literacy corner in a classroom or for those ocean mad tots that you’re working on alphabets with. We seem to have focused on the life in the oceans so far but this book Oceans Of The World In Color: Marine Life and Oceanography for Children goes into more details about the oceans themselves, where they can be found, what they are like, their names as well as a little on the creatures that live there. Ask a child to tell you some creatures that live in the oceans and at least one of the main animals featured in Oceans: Dolphins, sharks, penguins, and more! another National Geographic book will come up. Discover more about these wonderful animals and their underwater world, wanting to know more, learn about these and help them will not only help and protect these animals but also the whole ecosystem and all the animals within it. Can you find the creatures hidden in How to Hide an Octopus and Other Sea Creatures Reading Railroad while you do, and believe me that it can be a little bit difficult to find, read about the creatures and learn as you do. Books that are sensory are a hit with young toddlers and also older ones too, and Discovery Kids Splash in the Ocean! with 10 different sounds will sure to be a hit with them. Read along, press the buttons and learn about the Under Sea World. Look and Learn with this National Geographic favourite for toddlers – with simple words and bright colourful pictures National Geographic Kids Look and Learn will grow with you and your child. Soft, activity books like this Ocean Story Cloth Book Early Education Toy for Over 6 Months have a fantastic dual purpose you can read together but at the same time play. They are perfect to slip into your baby bag to take on trips or place in the car for your young toddler to “read” whilst you drive. With a finger puppet and in board book format In My Ocean is perfect to read with babies and toddlers. Read along and discover what makes the ocean such a great place for the little dolphin to live in. You can tell it’s a topic that authors love to write about when the section on Fiction Books includes most of your favourite children’s authors and illustrators. So with books by Eric Carle, Julia Donaldson, and Giles Andrea there’s our top 3 straight away. With rhyming words in the title and illustrated by Alex Scheffler The Snail and the Whale by Julia Donaldson on our bookshelf is falling apart it has been read so much. Can you find Tiddler from her other fantastic Under the Sea book within the illustrations? Mister Seahorse from Eric Carle is the perfect book for a child and their father to read together. It would make a great father’s day gift for a child to give to his or her dad with some read with me tokens and with classic Eric Carle illustrations it’s sure to be a great bedtime story. With magnetic pieces, this book Under the Sea Magnetic Story & Play Scene not only tells a story but also lets your children create their own stories. I loved listening to mine act out their own story with the people in the submarine discovering the underwater world. Way Down Deep in the Deep Blue Sea here’s a lot to find I guarantee! Starts this wonderful book for preschoolers. Follow the boy as he explores the ocean in this book with rhyming text and cartoon-like illustrations. Although out of print currently you can find second-hand copies of Under the Sea Picture Books or borrow from the library then do. Follow along with the tale as you visit the colourful coral reef down to the darkest depths of the ocean. Another favourite children’s author of our’s Leo Lionni is the author and illustrator behind Swimmy a story with a moral and a wonderful book to read aloud to your children. My eldest was fascinated by anything weird in the animal kingdom. I remember reading and watching the Octonaughts with him and the stranger the creature the more interested he was in it. When he was learning to read National Geographic Readers: Weird Sea Creatures was a huge hit and we read it together and then him alone. I still find him flicking through this now. Poetry is such a great form of literature to read together and although it may be a while before your child will be able to read everything in Commotion in the Ocean aloud to you, we spent lots of time reading it together pointing out the words that rhymed, the words that my children could segment and enjoying the fun illustrations.